I love hands on math. Don’t hand me a piece of white paper with black numbers, hand me an abacus, counting back money, cuisinart rods. One of my favorite aspects about “Arithmetic Village” is the Math manipulative kit which contains jewels, sacks and a treasure chest. I find showing math concepts and playing with them help me and my right brained friends tremendously. While I was reviewing the main lesson plans for King David Divide recently, I pondered for some time, trying to conceive of the main activity. It is easy to teach division by acting out sharing jewels, but I was trying to bring that lesson into a two-dimensional platform. Then it came to me – Paper dolls! I mean who doesn’t like to play with paper dolls? I immediately started finding villagers and adding them to an easy paper doll format to print. I created a simple paper doll for King David Divide (the thoughtful wise King who divides jewels fairly throughout the village) and a paper-doll of the King’s dog, Rover (he represents remainder). 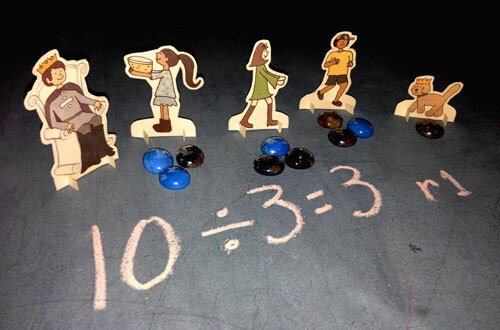 I combined these dolls with a laminated “playsheet” to keep track of the numbers, and this is all you need to introduce and practice basic division. The free downloads are available on King David’s page under “Teach”, or you could have lots of fun creating your own paper dolls at home! You can even make them look like people from your own family!